These coolers also make perfect dust proof containers even for your electronic goods like cameras, Navigation systems, etc. For campers who wish to minimise the openings on the large Ice box, these make a perfect secondary Ice box to transfer your ration and use these for frequent openings thereby minimising the openings on the larger Ice box which has all your frozen meat and drinks for the trip. 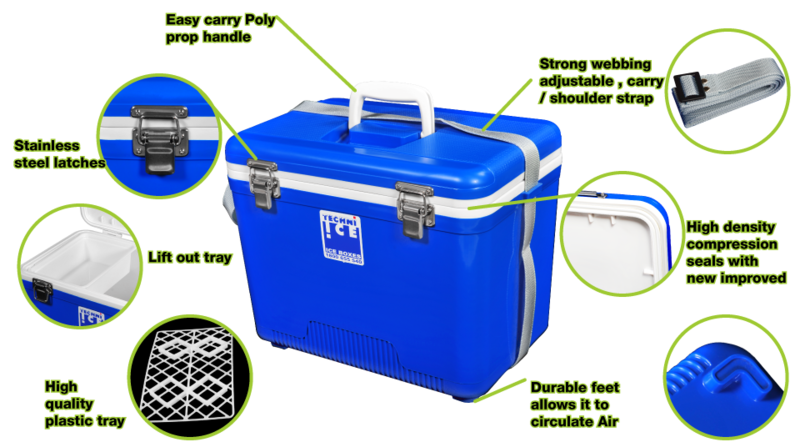 The Techni ice compact Coolers come in 3 sizes – 12 Ltr, 18 Ltr and 28 Ltr. Due to their compact nature and light in weight they make the best insulated containers to keep products like Frozen meat, cheese, medicines cool on Flights. This product here is the Techni Ice compact series of ice boxes. These are primarily designed for people that want to use a box, not so much for long extended camping trips, but more for situations where you need to take hot or cold food to friends' houses or you want to go away just for a couple of days. They’re a properly built compact type box and a much better alternative to a lot of the cheap type of boxes that are around that don't have insulation and things like this. These are a properly insulated box. They've got rubber seals on the lids. In fact, these particular boxes, this range of boxes are totally air tight, water tight, dust proof. There's an emerging lot of customers, we've noticed with these that buy them to keep electronics gear and stuff like that in. They put their laptops and cameras and phones and things like that in them when they go out kayaking or when they are on their four wheel drive trips. They want to keep all that red dust out when they are in the Outback. So, they are an excellent box for doing that type of thing. They come in two colours, pink and blue. You might think a pink one is a strange colour to build an ice box in, but more and more women seem to be wanting these type of boxes to put makeup in, to take wine and things like that. You'll notice they can actually handle a bottle of wine standing up. It's 28 litres, so that's' quite a lot of room in it. It's got a fold down handle on the top, stainless steel latches, proper seals and it's a quality thing. It's got these straps on it. In fact, the whole series have got these straps. You can either carry them like this, or you can actually put them over your shoulder and carry them. In fact, one of their uses, there's quite a lot of these being used in Japan and America now. They are using them for things like pathology boxes. So they certainly do meet quite high specifications. They're use for collecting pathology samples and so on. So, the strap goes right around underneath. They are also slightly elevated so again a bit like the big signature series. These have got the gap underneath them so if you put them down on something hot, it doesn't affect the performance of the box. It allows air to circulate around the base of the box preventing the heat from the ground or from some hot surface you may put it on from actually entering the ice box.